While prevention is always better than having to deal with infections after the fact, and since cleanup can often be an incredibly difficult process, the following tutorials were created to assist you with using known methods to get Malwarebytes up and running when it is being prevented from doing so by the infections on your system. Note: The below workarounds will not work in all situations and you may need expert assistance to fully clean an infected system. The following tutorials are simply to help you in getting Malwarebytes up and running and to correct some common issues caused by current infections. If the below methods do not fully resolve your issues or you are not too computer savvy and would like the assistance of an expert then we advise you to follow these instructions to receive assistance with getting your system cleaned up. What should I do if none of my security applications will run? Some infections prevent Malwarebytes from being able to run normally. To get around this, Malwarebytes Chameleon was created. In order for this to work, you must already have Malwarebytes version 2.0 or later already installed on your infected PC. Once the Help file opens, click on each Chameleon # button until you see a black DOS/command prompt window that remains open and says MBAM-chameleon ver. at the top Note: If running Windows Vista or Windows 7 you may see a User Account Control prompt. If so, click Yes. If the above did not work, try one of the other methods listed within this FAQ. And remember, an ounce of prevention is worth a pound of cure. Next time keep yourself from getting infected in the first place by adding Malwarebytes Premium to your current security setup to keep these infections from getting to your systems. Sometimes infections will prevent Malwarebytes from being installed. This is one of the issues that Malwarebytes Chameleon was created to address. Make certain that your PC is connected to the internet and then open the folder where you extracted Chameleon to and open the Windows folder within and double-click on the Chameleon CHM help file and then follow the onscreen instructions to use it. Note: If running Windows Vista or Windows 7 you may see a User Account Control prompt when clicking the buttons in the help file. If so, click Yes. If that did not work to get Malwarebytes installed and running, then please try one of the other methods listed within this FAQ. Normally, in order to run Malwarebytes Chameleon, you would click START>All Programs>Malwarebytes Anti-Malware>Tools>Malwarebytes Anti-Malware Chameleon. Sometimes this is not possible because your START menu is inaccessible. The following methods may be used in such cases in order to launch Chameleon manually. Sometimes you are unable to open Malwarebytes Chameleon normally because help files will not open or you receive an error when you attempt to do so. In order to work around this, you may launch Malwarebytes Chameleon's executables manually. Next, double-click on each file one by one until you find one that works, which will be indicated by a black DOS/command prompt window Note: Do not attempt to open the file named mbam-killer as this file serves a different purpose and if running Windows Vista or Windows 7 you may see a User Account Control prompt when attempting to open the files. If so, click Yes. Once complete, open Malwarebytes and click on the Scan Now button on the Dashboard and wait for the program to check for any available updates If any are found, click "Update Now"
Note: For Windows XP additional steps may be required for this method to work. Please refer to this link for details. Once complete, open Malwarebytes and click on the Scan Now button on the Dashboard and wait for the program to check for any available updates. If any are found, click "Update Now"
There are 6 different versions. If one of them won't run then download and try to run the next one. Note: The following methods assumes that Malwarebytes is already installed on your PC. Once that is done, you should be able to open Malwarebytes and run a scan to remove the infections. Reverse the above steps to set Windows to hide hidden and protected system files and folders. Note: This procedure may be required if the infection has broken EXE file associations so that you see prompts such as Open With for EXE files. When the machine first starts again it will generally list some equipment that is installed in your machine, amount of memory, hard drives installed etc. At this point, you should gently tap the F8 key repeatedly until you are presented with the Advanced Boot Options menu. Select the option for Safe Mode with Networking using the arrow keys. Then press Enter on your keyboard to boot into Safe Mode. Click on Dashboard and then click the Scan Now button and wait for the program to check for any available updates. If any are found, click "Update Now"
Note: If prompted to reboot to install the DDA driver, click Yes and allow your system to restart and wait for the program to check for any available updates. If any are found, click "Update Now"
After the files are extracted, double-click the mbar.cmd file. If you are unsure which file this is, try double-clicking both files named mbar - only one of them will run. Once the tool launches, follow the on-screen instructions to perform a scan with Malwarebytes Anti-Rootkit. Only advanced users should remove infections by themselves. Sometimes browser hijackers alter the shortcuts on your desktop, taskbar and start menu to make sure you visit the sites they want you to visit or to enable them to deliver their advertisements. If the infected shortcuts are pinned at the taskbar, right-click the icon and choose "Unpin this program from taskbar"
Removing them from there may require a reboot for the removal to take effect. Once the altered shortcut is removed, rightclick your desktop and choose "New" -> "Shortcut"
Then browse to the location of the executable you want to start with the shortcut. "Program Files" may be "Program Files (x86)" if you are running a 64 bit OS. Please note that the quotes are necessary for these shortcuts to work. Then click "Next" and "Finish". Check if the shortcut is working properly and drag it to the taskbar, which will offer you the option to pin it . You can use the same procedure and pin the shortcut to the Startmenu by dragging the icon to the start button, which will offer you to pin it to the start menu. Existing Shortcuts on the desktop can also be cleaned by rightclicking them, then choose "Properties" and in the "Target" field, remove everything after the path to the executable. Remember to leave the quotes. Sometimes after removing malware or potentially unwanted programs (PUPs) scheduled tasks are left behind which might result in "missing file" errors. This post will explain how you can delete unwanted scheduled tasks. 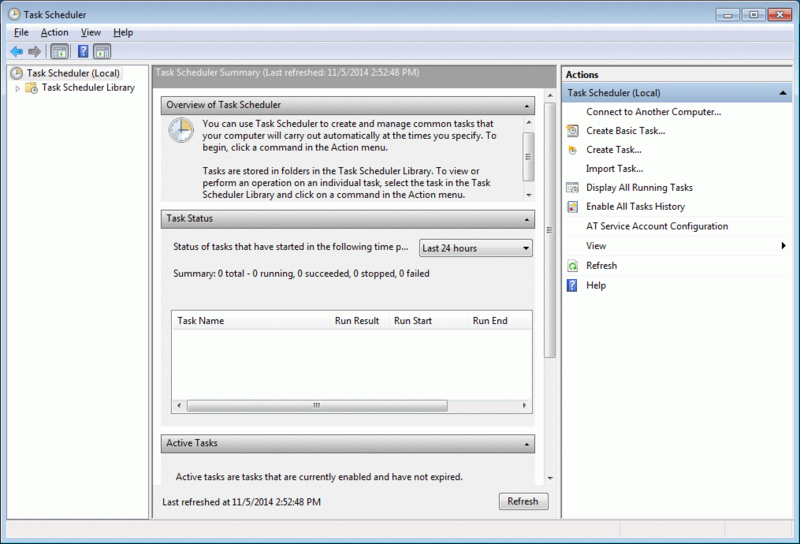 Select the "Task Scheduler Library" to see a list of Scheduled Tasks. You can select any single task to see the properties of that task in the lower pane. Which file will be run when the Scheduled Task is triggered, can be seen under the "Actions" tab. If you have found a task that you wish to remove, you can select the task and click on "Delete" under "Actions" > "Selected Item"
There will be a prompt asking "Do you want to delete this task?" Click "Yes" if you are sure the task should be deleted. If you are unsure, ask an expert or post a question on the forums. Please read and follow the directions here, skipping any steps you are unable to complete. Then create a NEW topic here. One of the expert helpers there will give you one on one assistance when one becomes available. Please note that it may take 48 hours or more for you to receive a response in the malware removal forum, as it is often busy at times. Please do not reply to your own post asking for help unless it's been more than 48 hours since you originally posted, as this can make it appear as though you are being helped and take longer for you to get help. If you are unable to do all or any of the steps in the link to the directions above, just post your problem into the forum in the above link anyway and someone will be able to assist you. If you prefer to be assisted via email you may contact Malwarebytes Consumer Support and one of our support staff members will assist you directly. If you are a reseller, affiliate, technician, corporate, business, educational, government or non-profit customer then please contact Malwarebytes Business Support and include full contact details along with your Cleverbridge order Reference # when you do to ensure that you receive prompt assistance. And remember, an ounce of prevention is worth a pound of cure. Next time keep yourself from getting infected in the first place by adding Malwarebytes Anti-Malware Premium to your current security setup to keep these infections from getting to your systems.